L: 30.5" x W: 33.5" x H: 37"
Hutchinson Accent Chair One quick look at the Hutchinson accent chair, and it's easy to imagine loving your living room more than you ever thought possible. Subtle button-tufting on the back and a simple design allows the lovely print pattern to shine. This accent piece will create a well-rounded look in your home. One quick look at the Hutchinson accent chair, and it's easy to imagine loving your living room more than you ever thought possible. Subtle button-tufting on the back and a simple design allows the lovely print pattern to shine. This accent piece will create a well-rounded look in your home. Great quality and looks beautiful. It’s very comfortable and looks wonderful in our living room. The color is multicolored which goes with most all decor. The chair is great for my husbands lower back issues. Love your quality and prices! We absolutely loved the chair. The colors were just what we needed. love this chair ! very comfortable happy with my decision . all staff wonderful at raymour flanigan! Love the chair It looks great in my home makes a cozy appearance. Store service and delivery is the best ever. Chair is firm yet comfortable. Colors match our leather furniture nicely. Only downside is that it is manufactured in China and in the store the tag stating such had been ripped off and the sales person didnt know who the manufacture was. It may have been a game changer at the time, but now that it is in the house I am satisfied. Is this chair available to see in store? 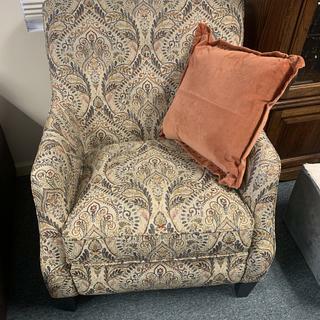 What colors are in this chair and what is the base color? the back ground is tan has many color goes with anything. Have received many compliments on it and it’s very comfortable.